Let your children make a set for their moms and a set for themselves because they will love playing with the standup figures. 1. Print the pattern onto white card stock. 3. Fold the kitten's and mother's bodies and glue on the heads. Tape the kitten on the mother's back. Children will love this craft because the little joey can be placed inside the mother's pocket and then removed. A short note can be folded up and placed in the pocket with the joey. 1. Print the pattern onto tan card stock. 2. Cut out the patterns and color them. Write a message on the pocket and staple it to the front of the mother. 3. Insert the joey into the pocket. 4. You can also have your children write a note to their mothers, fold it up, and place it in the pocket with the joey. 1. Print out the card pattern onto colorful paper, and the leaf pattern onto green paper. 2. Color the bud and stem on the card pattern. 3. Cut out the leaf patterns and glue them to the circle on the card pattern as shown in the picture above. 4. Cut slits in the paper cup from the top of the cup all the way down to the bottom of the cup. Fold back the petals you made by cutting the slits. 5. Glue the cup on top of the leaves. 6. 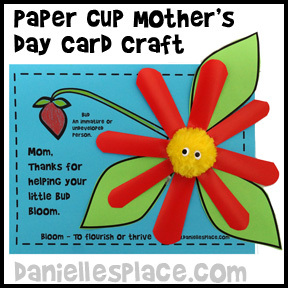 If you are not using the printable pattern write "Mom, thanks for helping your little bud bloom on the side of the flower. Also add "Bloom - to flourish or thrive" and "Bud - an immature or undeveloped person." 1. To make the flower cut flower shapes from the animal print tissue paper making each flower a little smaller than the first. 2. Crinkle up the tissue flower shapes a little and then glue them together one on top of the other starting with the larger flowers on the bottom. 3. Glue a sequin, bead, or button in the center of the flower, and glue a chenille stem to the back of the flower for the stem. 4. Glue the flower to a piece of colorful paper and write "Mom, I'm wild about you!" on the paper. Woodsies Mini Jumbo Craft Sticks - Use good quality craft sticks that lay flat. The 5/8" work perfect with the one-inch tape. *You can use the Woodsies Jumbo Craft Sticks with the 1.5 Inch - 3M Scotch Masking Tape for a Bigger Canvas. 1. Clean and then paint the river rock. 2. When the paint is dry glue on eyes and a nose. 3. Cut a short length of feather boa for the hair and glue it to the top of the head. 4. Add decorative items to the hair such as ribbon, buttons, and beads. 6. Print out the "Mom, You Rock" note card onto card stock and cut it out. Glue the rock to the note card. 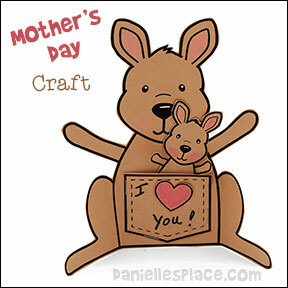 Remove the little bear from the mother's bear's arm and the words "Mom, You're Beary Special!" 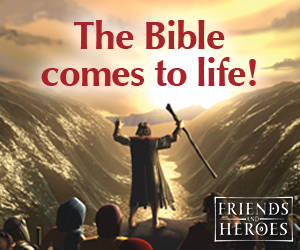 are revealed. Print out the pattern onto brown card stock and all you have to do is color the ears pink and cut out the patterns. 1. Patterns for this craft are available to members only. If you aren't a member, draw a big bear and a small bear that will fit in the arm of the big bear on to card stock. 3. Cut around the arm of the big bear so that the little bear can be inserted under the big bear's arm. 2. 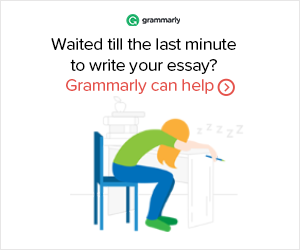 Write "Dad, You're Beary Special!" on the stomach of the big bear so that it isn't visible when the little bear is in the big bear's arms. 1. Patterns for this craft are available to members only. If you aren't a member, use a computer program to make a frame shape and print it out onto card stock. Cut out the frame, and the center of the frame. 2. Print out the paw print patterns onto different colors of card stock and cat pattern onto a cat colored paper, cut them out, and glue them to the frame. If you aren't a member you can use clip art or draw the paw prints and cat onto the frame. You can also buy a cheap frame from a Dollar Store, glue the pictures onto the frame, and write the saying on the frame with a permanent marker. 3. Draw a picture for your mom and place it in the frame, or use a picture of yourself and your mom. 2. 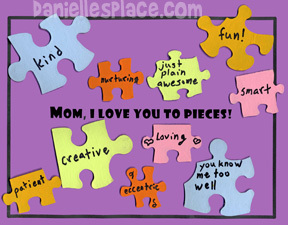 Write "Mom, I Love You to Pieces" on a piece of card stock. 1. 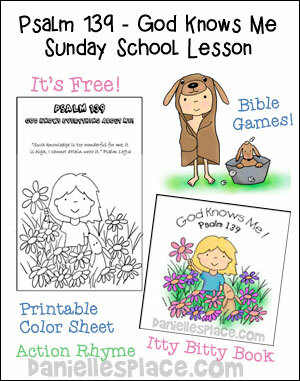 Print out the pages to the cards and have your children color the pictures. Glue a bandaid to the cover page, eraser to page 1, piece of tissue to page 2, a penny to page 3, seeds to page 4. 2. Do not cut the pages apart. out. Do this for all of the pages, putting them in order as you go. The folded edge of the cover should be on the left and the folded edges of the other pages should be on the right when assembled. 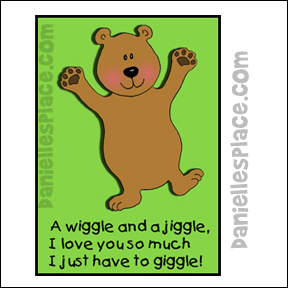 The little bear on this card wiggles and jiggles back and forth. 1. Print out the bear patterns, cut them out and color them. Cut out the curly cue looking thing on the solid lines to make a snake. 2. Print out the card patterns and cut them apart. Tape the bears to the center of the card. Tape the outside end of the snake to the card and the inside end to the back of the bear. This will allow the bear to wiggle back and forth when the card is picked up. "Mom, I'm glad you're my mom. If you weren't my mom, I wouldn't be your kid, and I wouldn't be able to give you this!" 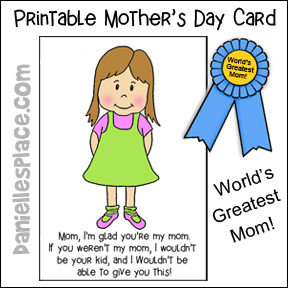 Mom opens the card to find a blue ribbon that says, "World's Greatest Mom!" 2. Have your children color the pictures and fold the card in half. 3. Print out the ribbon patterns, cut them apart and color. To make it extra special, you can cut the blue ribbon hanging from the bottom and replace with a real blue ribbon. Just wanted to say thank you for this craft. It went so well in Sunday School today. The 2-3 yrs olds loved it. (The kids are now 3-4 yrs but will be with me till Sept.). I printed out the card, had made a photo of them a few weeks ago, made slits inside the card so that their photo would stay in it. They colored the outside picture of the boy-girl & we wrote Happy Mother's Day on the front. Fixed their photo in side the card. Enchanting Learning - Mother's Day coupon cards, butterfly card, pop-up flower garden card and a hanging wall pocket from paper plates. DLTK - You will find: Mother's Dad Cards, Coloring Pages, and don't miss the beautiful coffee filter flowers.